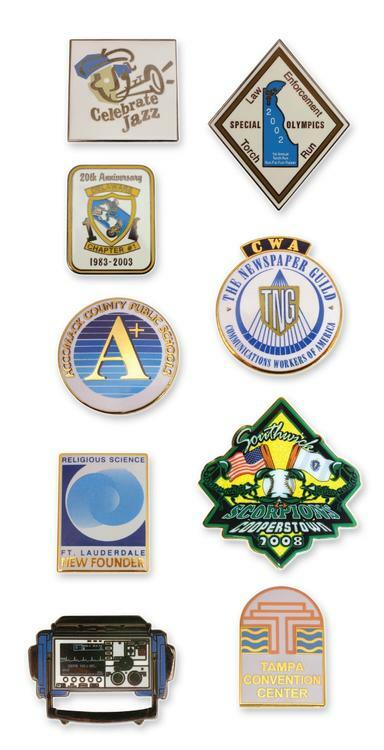 This custom designed pin incorporates your logo or design and hard enamel without any metal separations. The silkscreen process allows for reproduction of the smallest detail. Your emblem is die struck and hand filled with one color hard enamel. After it is hand polished, a silkscreen overlay of PMS colors is used to reproduce your design, resulting in a beautiful emblem. • One silkscreen color and one enamel color. Spur-nail/military clutch and individual polybag. • Emblems can be plated gold, nickel, bronze or black nickel.